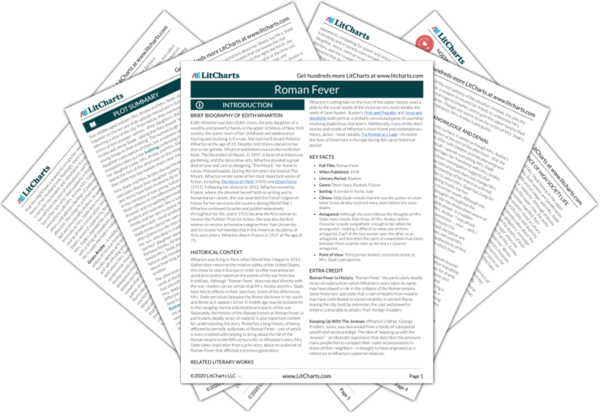 The term “Roman Fever” refers to a particularly deadly strain of malaria. The disease itself plays a key role in Mrs. Ansley’s story of her Great-Aunt Harriet, who—according to family lore—once ordered her younger sister on a nighttime errand during an outbreak of Roman Fever in order to expose her to the fatal disease and, in doing so, eliminate competition in her pursuit of the man they both loved. (The risk of catching malaria is highest at night, when the mosquitos that transmit the disease are most active.) This is the story that inspires Mrs. Slade’s plot to get Mrs. Ansley “out of the way”—and, in doing so, to secure her relationship with her then-fiancé, Delphin—during their visit to Rome as young women. In addition to being an essential plot device, the concept of Roman Fever evolves over the course of the story into a metaphor for the destructive potential of romantic and sexual passion—and of the jealousy and competitiveness those feelings may inspire. Just as Roman Fever sickens the body, the figurative “fevers” of passion and jealousy destroy relationships between people who should be held together by bonds of love, loyalty, and respect. Great-Aunt Harriet betrayed her familial bonds when she plotted against her sister, while Mrs. Slade and Mrs. Ansley betrayed their bonds of friendship—Mrs. Slade by callously endangering her friend’s life and Mrs. Ansley by agreeing to meet Delphin at the Colosseum. Furthermore, Delphin betrayed the bonds of his engagement to Mrs. Slade by having an affair with Mrs. Ansley. Consumed by their emotions—emotions that become more intense in the romantic foreign setting, hence the specifically “Roman” quality of Roman Fever — these characters abandon essential moral values and act without regard for social mores or expectations. Moreover, if Mrs. Slade had trusted Mrs. Ansley instead of treating her with suspicion and trying to get her “out of the way,” perhaps she would never have sent the forged letter from Delphin, in which case Mrs. Ansley and Delphin may never have met. In this sense, Mrs. Slade’s faithless treatment of her friend, Mrs. Ansley, has the unintended effect of setting in motion the very affair she had so feared would take place. The consequences of Mrs. Slade’s actions are part of the overall effect of this “fever,” and in this sense Wharton seems to be using Roman Fever also as a symbol to critique the way that competition among women spawns distrust and animosity between them like a sickness, destroying lives and relationships. The timeline below shows where the symbol Roman Fever appears in Roman Fever. The colored dots and icons indicate which themes are associated with that appearance. Jensen, Carlee. "Roman Fever Symbols: Roman Fever." LitCharts. LitCharts LLC, 7 Nov 2017. Web. 21 Apr 2019. Jensen, Carlee. 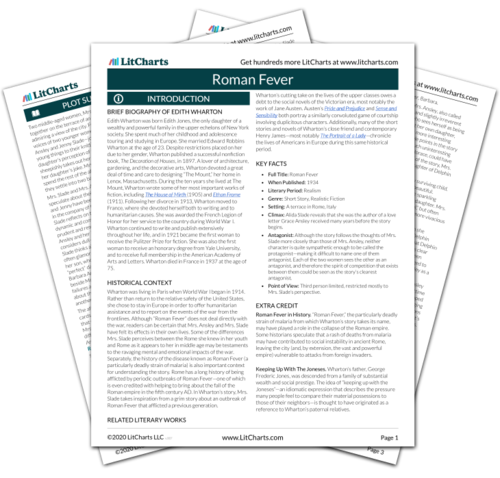 "Roman Fever Symbols: Roman Fever." LitCharts LLC, November 7, 2017. Retrieved April 21, 2019. https://www.litcharts.com/lit/roman-fever/symbols/roman-fever.